First Light's Permanent Supportive Housing program serves individuals who are seriously mentally ill and unlikely to live independently. 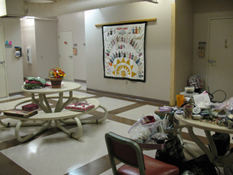 Occupying the 4th floor of First Light, the permanent housing program consists of 9 individual rooms in a community setting. The kitchen, dining and activity area and the community/TV rooms are shared space. Their bathroom area includes multiple sinks, showers and toilet facilities. First Light organizes activities for these guests such as cooking together, movie night, grocery shopping, birthday parties, holiday parties, field trips, arts and crafts, self-esteem building, makeover days and other life skills programs. Many of the residents are those who stayed in the basement shelter of First Presbyterian Church. Some "lived" in the basement shelter and/or on the streets for many years. First Light’s 4th Floor permanent housing program provides a supportive environment where residents have a better quality of life and live at their highest level of self-sufficiency. First Light is their home. It is not unusual to see the 4th Floor residents gathering to go on a group outing with their Social Worker. They might go to lunch, shop at a dollar store, see the ballet or a concert (community agencies are gracious and sometimes offer free tickets for a group of our guests to attend their events.) They receive visitors from time to time or may leave for a weekend visit with a family member or friend. Chores are posted and rotated so the guests take turns keeping things tidy and clean. The beauty of this scenario is that the fourth floor guests are living independently, but with the constant attention and support that assists in keeping them happy in a stable environment. 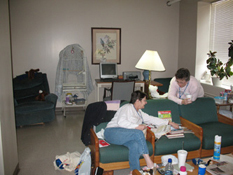 Supportive care is essential for our guest’s ability to keep their housing.